Venue: Surya Sainik Institute, Cariappa Marg, Near Command Hospital, Lucknow Cantt. Date & Time: 8th Sep. ‘13, 3pm to 6pm. Sujok, based on ancient medico-philosophical principles, is a remarkable system of healing that helps to bring the body to the natural state of health that it is designed to be in. The Sujok Therapy system uses a combination of physical, energy & transcendental treatments for treating specific organs and mental & emotional states of a person. In Korean, the language of the founder Prof. Park, Jae Woo, Su means ‘hand’ and Jok means ‘foot’. 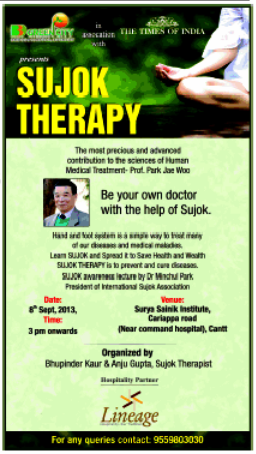 Sujok is based on the knowledge that our hands and feet have inbuilt systems for curing the diseases of the human body. It is a new science with roots thousands of years old. It is old because the systems used are a collation of principles used in India, China, Egypt & even Phoenicia for over 2000 years. Bits and pieces are known in most traditional households. 1. The system of education we have been taught under in the last 100 years, invariably indirectly encourages scoffing at traditional knowledge and belief, though words to that effect are not used. 2. Though ancient systems of all types including Chinese systems, Yoga, Reiki, Reflexology etc. 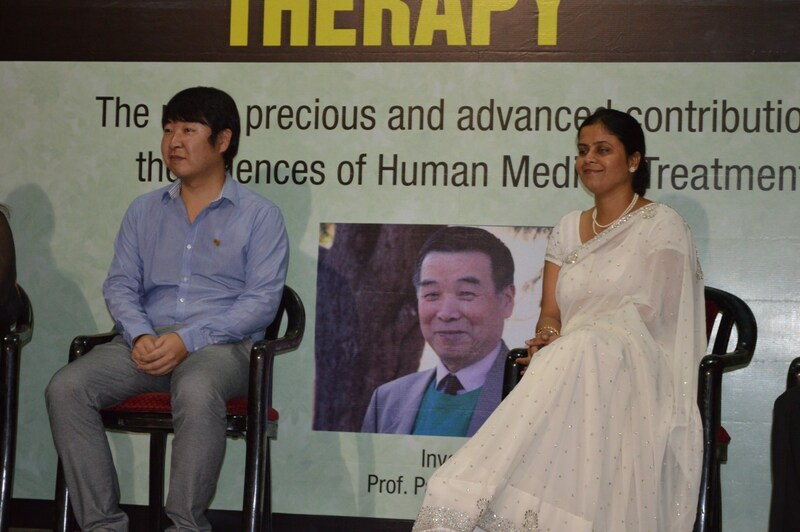 have been collated, a huge amount of brilliant research has been done by a genius Prof Park Jae Woo, an MD from Korea who had resettled in Moscow. From 1968 to March, 2010 when he passed away, he built an incredible connectivity between these systems and evolved much simplified solutions than traditional systems have. The concepts and applications of “Triorigin” have been invented and the application of those principles for medical treatments have been developed by Prof. Park, Jae Woo. The basic systems of Sujok are very easy for anyone to do. No specialized medical knowledge is required for treating day to day ailments and even some difficult looking diseases. This seminar is one of a series of similar ones which are designed to spread the knowledge of Sujok healing to every household in the world. Such was the desire of Prof. Park. Lucknow, with its hundreds of years of cultural richness, has welcomed the Science of Sujok in the last few months. It will remain a city which will receive our focused attention for dissemination of this treasure of knowledge.